So is anyone else kinda tired already of all the orange, black, and yellow colors for Halloween? 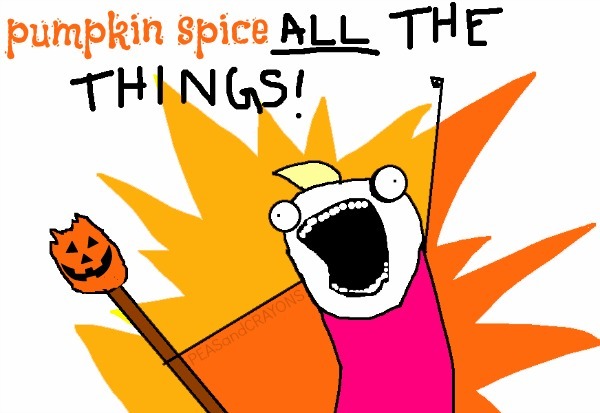 I know right, it's barely October so how can I be bored with it already?? Probably because I've been over at Pinterest way too much lately and there's all sorts of Halloween treats and crafts being showcased over there, pretty much since the end of the summer. 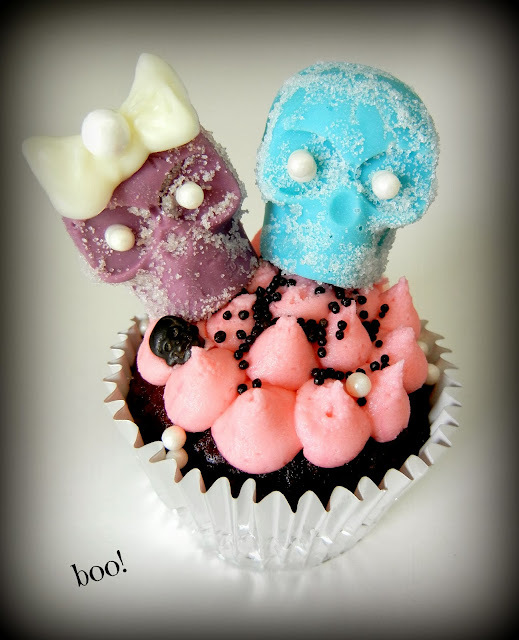 But I 'm still excited for some Halloween treats - but just in some different colors. 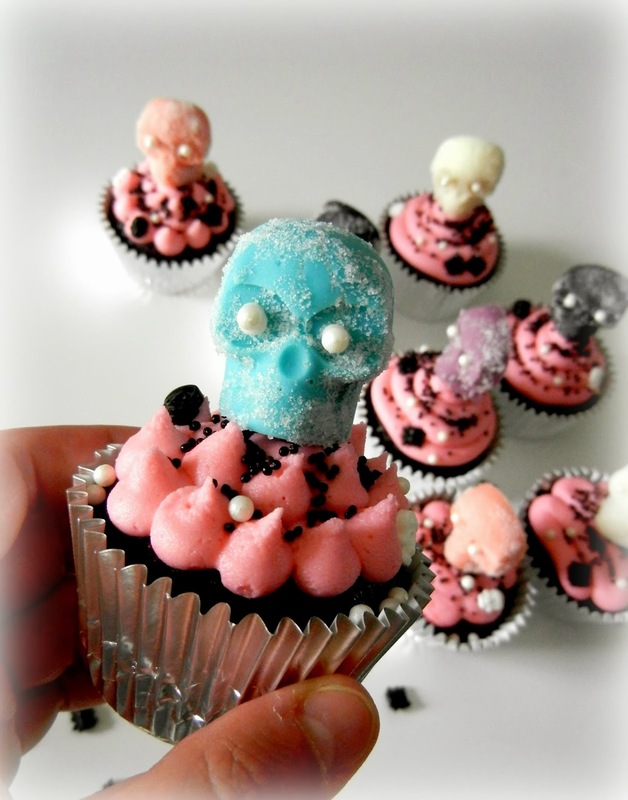 Hence the glam'ed up skull cupcakes. First some candy skulls - in pink, light blue, purple, white and black. 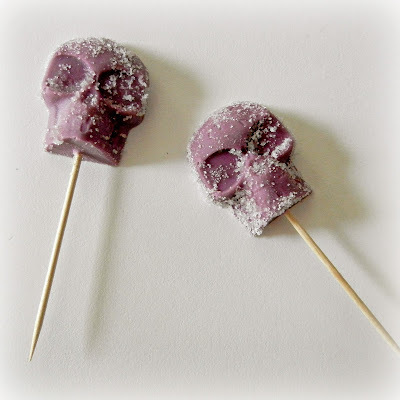 These are simple too, just add some candy melt to some ice cube tray molds- at let the candy re-harden. I get alot of the molds for real cheap at dollar stores or Target. 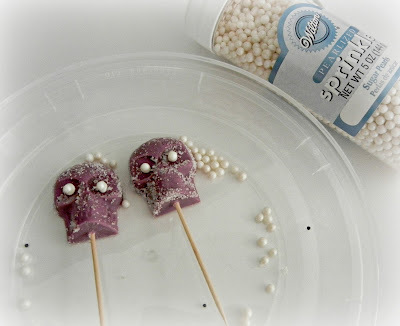 I had wanted to make these glittery skulls, but didn't really have any edible glitter and guess what, I tried this homemade glitter (which is everywhere on Pinterest). I'm not sure where the original idea comes from but it didn't really work for me. Not "glittery" at all. 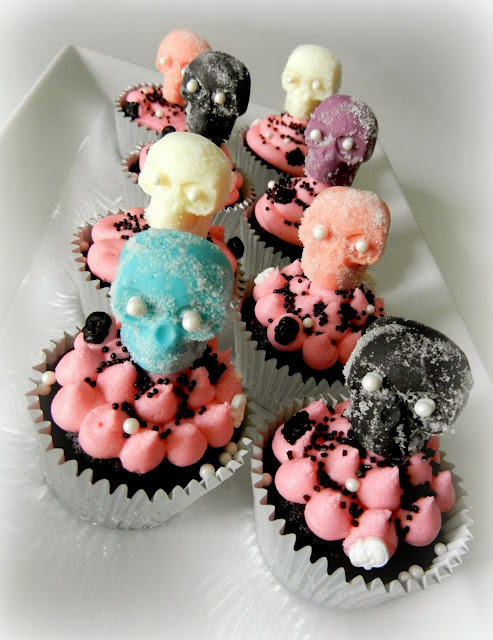 So instead I just brushed the skulls with a little water and dipped them in regular granulated sugar. I guess it kinda works, but not really the look I had in my head. Plus I thought they needed a little something-something, like pearl eyeballs. Pearlized sprinkles always makes stuff fancy, no? Twist a toothpick in the bottom and you have some instant cupcake toppers. 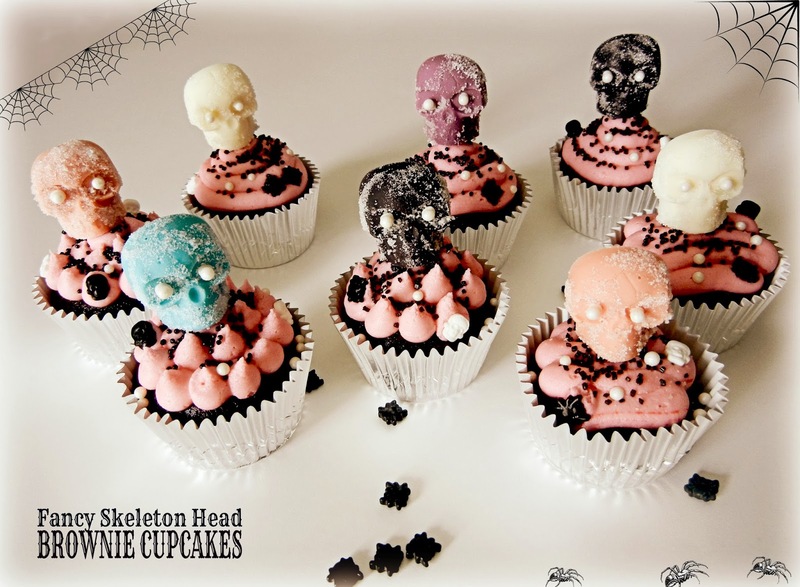 I added these to a boxed brownie mix baked as cupcakes. Pipe some pink buttercream on top and add more black sprinkles and a few more pearl sprinkles. If you have spider or skull candies, throw them on too. And you can make a cute couple. That's sorta halloween-y in a cute, spooky, fancy way right? Thanks for stopping by, always appreciated! Oh and if you have made homemade edible glitter and it worked for you, please let me know your secret! Is it magic??! I need some of those in my life, asap. Thank you Jess, I wish I could have sent you some! These are so fun. I saw the molds at Dollar Store but didn't buy them not I know I should have! I buy them all the time, I recently found a pickle and a bacon ice cube tray, now what to do with them?! This is very cute, my favorite is the one with the bow (of course!) I have never made edible glitter, but I have seen it all over Pinterest. I know I was hoping the edible glitter would work because everyone has it pinned! Sadly it did not work for me. These are so much fun! Found you through the DIY Home Sweet Home party. thanks for stopping by Charisa! Those are so fun! Spooky, yet cute at the same time! thanks Marie, yeah my girlie girl gets tired of all the spooky halloween stuff! These are so cool Michelle! I got the same skulls I believe at the Xmas tree shop or the dollar store, lol...will give it a try although lately I've been having problems getting my candy melts to really melt and allow me to pour them in the molds. Any tips highly appreciated! Thanks Lizzy. I usually melt candy melt in zip lock bag, then snip an end to squirt into mold. It works great!